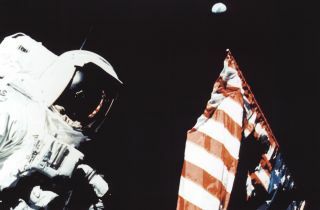 Astronaut Harrison Schmitt with the American flag and the Earth in the background, during a trek on the lunar surface as part of the Apollo 17 mission. A former NASA astronaut who was the 12th person to walk on the moon may have seen Earth from space — but he doesn't see that human actions are shaping global climate change. Today (Oct. 15), Harrison Schmitt, a geologist who flew on the Apollo 17 mission in 1972 and who and who was the last person (who is still living) to have visited the lunar surface, told a roomful of science journalists that he did not believe climate change is caused by human activity, despite overwhelming evidence and scientific consensus to the contrary. At a Q&A after the panel "Apollo Plus 50," New York Times reporter Nicholas St. Fleur asked Schmitt about his documented denials of human-influenced climate change. Schmitt countered by saying that he "saw no evidence" that global warming was taking place as a result of human activity, and that climate change wasn't happening as quickly as reported, audience member and astrophysicist Adam Becker wrote in a thread on Twitter. According to Becker, St. Fleur first read aloud from a 2009 article in the New York Times that quoted Schmitt bemoaning the stubborn denial of conspiracy theorists who claim astronauts never visited the moon. St. Fleur then asked if Schmitt saw the irony in denying climate science, after speaking out about people who claimed that the moon landing was a hoax. "I see no irony at all," Schmitt answered St. Fleur (his response was recorded by National Geographic writer Maya Wei-Haas, who shared the audio in a tweet). In the recording, Schmitt said that the Earth had experienced climate change events in the past and was undergoing climate change now. "The only question is, 'Is there any evidence that human beings are causing that change?'" Schmitt said. A chorus of voices rose immediately from the audience, responding with cries of "Yes!" But Schmitt countered by saying that in his profession — geology — there was no evidence of human influence on the climate, only models. And models are "often wrong," he said. But a geologist in the audience, Betsy Mason, also a writer for National Geographic, quickly interjected that Schmitt "should reconsider speaking for all geologists on that topic." In fact, The Geological Society of London concluded that humans were the cause of rapidly accelerating climate change in a statement published in 2010. Society members wrote an addendum to the statement in 2013 explaining that new climate data from the geologic record bolstered their original conclusion — "that CO2 is a major modifier of the climate system, and that human activities are responsible for recent warming." Schmitt was correct about one thing: Earth has undergone dramatic climate shifts in its geologic past. However, those climate change events unfolded over millions of years; the current effects of global warming — spurred by excessive quantities of carbon dioxide pumped into the atmosphere by human activity — are spooling out over decades. Climate hazards such as droughts, floods, wildfires and extreme storms are already reshaping the world, and their impacts will only intensify if CO2 consumption continues unchecked, 700 scientific authors and editors recently wrote in a report for the United Nation's Intergovernmental Panel on Climate Change.